The first season of Star Wars Rebels is now available on Blu-ray. 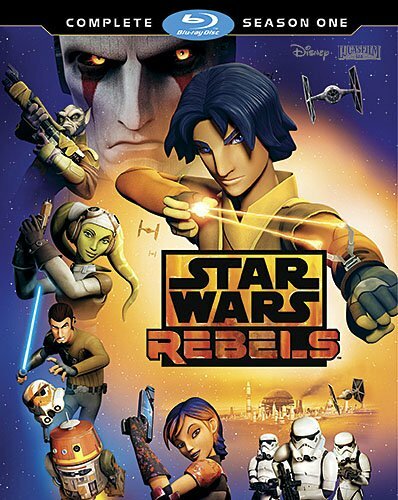 Star Wars Rebels is a cool CGI-animated show which is set in the time period between Star Wars Episode III: Revenge of the Sith and Star Wars Episode IV: A New Hope . It is the follow up series to Star Wars: Clone Wars TV show, which I also enjoyed (except for its final season), but I definitely like this show more. It feels more like the original Star Wars movies with a small band of rebels fighting against a giant empire. The story introduces us to a 14 year old boy named Ezra Bridger, an orphaned thief who stumbles across a small 4-person band of rebels and ends up joining them. The crew consists of Jedi Kanan Jarrus, pilot Hera Syndulla, 16-year old weapons expert Sabine Wren, and Zeb Orrelios, a humanoid creature that's reminiscent of Chewbacca with less hair but a more gruff attitude. The also have an astromech droid with them, reminiscent of R2D2, except an older model. Together, then travel the galaxy on their ship, the Ghost, surviving as smugglers and trying to strike back against the evil Empire when they can. The show is fun and adventurous with both light-hearted moments and more darker moments. The primary villain of season one is a force user simply known as Inquisitor. He has this cool double lightsaber that rotates at its center. He works under Darth Vader, who makes a cameo appearance. Other characters from the original trilogy show up as well, but I won't say who. I don't want to spoil the surprises. The blu-ray release contains all episodes of the first season including the 1-hour premiere episode (which is more like 45 minutes because they have to leave room for commercials when broadcast on television). There are also special features such as animated shorts, a bunch of behind the scenes featurettes, and a look at season 2. They are exactly the kind of extra features that I like. This is a good show that both kids and adults can enjoy and Disney did a good job with its blu-ray release. I doubt you'll be disappointed if you pick it up.